WANT TO BUY scope mount for red dot that does not require drilling and tapping a P210's slide. I have the Swiss made P210 which is collectable and valuable, so I don't want to modify it. The red dot scope I use is Ultradot Match-Dot. The GRIP MOUNT type, which holds the scope mount above the slide, probably would be best, like the grip mount types that were popular for 1911 pistols. If none are available, does anyone know if a custom made grip mount can be made? Don't want the discontinued B-Square slide-stop mount type like for the 1911. I don't use reflex red dot. Try contacting Aimtech Mounts. They make grip mounts for a large variety of pistols. I used their grip mount for 1911 and it works well and holds up well. They don't list a mount for a SIG 210 on their site but looks like they can make a mount to your spec. Thank you, Oleg. I emailed Aimtech Mounts. I'll see what they say. I heard back from Aimtech Mounts. They said they do not make a mount for the P210. So if anyone knows of a mount for the P210 please let me know. cl_fletcher wrote: I heard back from Aimtech Mounts. They said they do not make a mount for the P210. No, will not drill and tap a $3500 pistol that is collectable. cl_fletcher wrote: No, will not drill and tap a $3500 pistol that is collectable. Better stick that P210 back in the safe and buy a gun that you are willing to drill and tap. I am shooting my P210-5 (extended barrel model) in bullseye Center Fire matches with its adjustable iron sights. I took the dot off my Hammerli 208s and my 45 wad gun and now am shooting all three guns in matches with iron sights so to firm up fundamentals. But now I would like to shoot all three guns with the dot. But now Chris gave me an idea...maybe get a P210 slide and drill and tap that for the dot. cl_fletcher wrote: I am shooting my P210-5 (extended barrel model) in bullseye Center Fire matches with its adjustable iron sights. I took the dot off my Hammerli 208s and my 45 wad gun and now am shooting all three guns in matches with iron sights so to firm up fundamentals. Dunno where you would find a P210 slide? Likely would cost $1,000. Just to save a few bucks on resale value, I dunno if that's a wise move. I'd probably keep it until I died and let my kids keep or sell my guns after my death. There are some slides available I think, but hard to find. Mostly they are in Germany and Switzerland I think. What's important for P210 is frame and slide are serial numbered matched. So an orphaned slide alone is pricy, but not too pricy because its serial number doesn't match your P210's frame's serial number. I have a German friend I emailed who may know if a slide is available somewhere. My German friend says finding and bringing a slide from Switzerland to the US is now very difficult and expensive. A lot of difficult logistics involved and expensive. Though a slide is not a frame it is still a major component of a gun so Switzerland requires their laws be followed; export dealer, etc. is required. So, getting an extra slide to be drilled and tapped for red dot does not seem to be an option. Maybe you could find a "shooter grade" P210 and use the slide from it. Seems pricey though. Seems like a good machinist could make a grip mount for you. Let us know how it goes. It looks like the Leupold mount for a model 52 could be modified to work. Strongest mount would require some drilling and tapping but only under the existing grips. Put grips back on and zero holes would show. Just how I would do it. Or not. I did drill and tap the slide on my 952-2 6". They are going for around 5,500.00 now. There does not seem to be any difference in price for a excellent condition Swiss made P210 and a shooter grade Swiss P210. It seems all Swiss P210 are expensive and the prices are the same. Having a custom made grip mount type one made would work great I think. But who can make one and being it's just one made I think it would be expensive. cl, I was not suggesting you have someone build one from scratch. If you take a quality mount like a Leupold any good machinist should be able to modify it to fit. I picked the one that fits the 52 because the profile is a pretty good match to a 210. 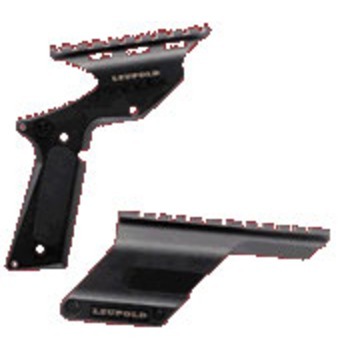 Your Leupold grip mount looks very interesting. Do you know where I can buy one? 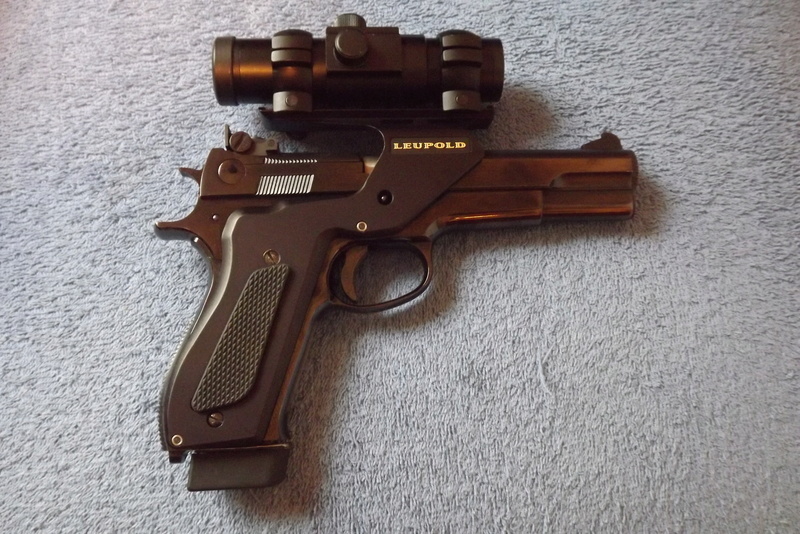 Leupold 52143. Ignore the picture. Ignore the picture. Ignore the picture. Did I mention that the picture is wrong?But that is the correct number. Because some people like pictures. About 90% of the sites that still have this mount use a generic picture. Some don't. I compared a Smith & Wesson Model 52 grip to my SIG P210 grip to see if the Leupold frame scope mount can be modified to fit the P210. It cannot, mostly because the 52 has a steel back-strap that is part of the pistol's frame whereas the P210's frame does not have a steel back-strap; the P210's back-strap is part of the wood grips. So the Leupold frame scope mount can not be modified to fit the P210.